For those of us who celebrate Christmas, the next few weeks are set to be the busiest time of the year. We all run around buying gifts, sending greetings cards, meeting up with friends and family, and generally being rushed off our feet for no apparent reason. However, Google thinks its Assistant can help you survive the holidays. And it has rolled out a bunch of new features designed to do just that. Some of Google Assistant’s new features are only loosely connected with the holidays, but we’ll let them off. Google Assistant now recognizes when you say “please” and “thank you”. The feature, called Pretty Please, rewards politeness by having Assistant reply in an equally polite manner. Google Assistant can now help you keep track of gift ideas by using notes and lists. You can create a gift list, add ideas to an existing list, and more besides, all with your voice. Google Assistant now lets you call Santa, and he needs your help while rehearsing for a concert. If you have a Smart Display you can even see some album covers for bands from the North Pole. If you have a Smart Display and a Google Play Music subscription you can now sing along to your favorite songs. Unfortunately, synchronized lyrics are only available for selected songs. You can also have Google Assistant read along to one of your favorite Christmas stories. The titles listed here will have music and sound effects added. Alternatively, you can just say, “Hey Google, tell me a story” to have one of 50 titles read to you. 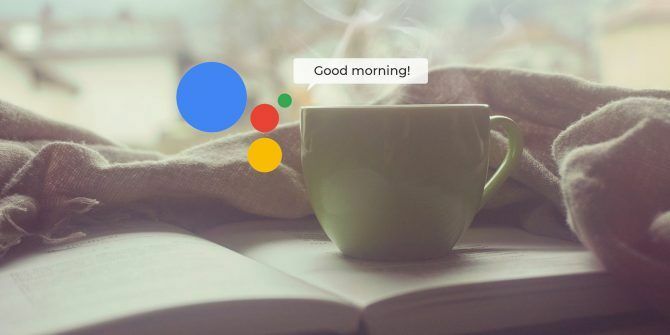 If you’re new to Google Assistant, check out our guide explaining how to use Google Assistant What Is Google Assistant and How to Use It What Is Google Assistant and How to Use It Google Assistant is a powerful voice assistant for Android and iOS. Here's what it can do and why you should start using it. Read More . And if you’re unsure whether Google Assistant is really better than its competitors, we’ve pitched Google Assistant vs. Siri Google Assistant vs. Siri: Which iPhone Voice Assistant Is Best? Google Assistant vs. Siri: Which iPhone Voice Assistant Is Best? How does Google Assistant work on the iPhone, what exactly can it do, and is it worth your time? Read More and Google Assistant vs. Cortana Google Assistant vs. Cortana: Which Digital Voice Assistant Is Better? Google Assistant vs. Cortana: Which Digital Voice Assistant Is Better? Is Google Assistant or Cortana better? We tested these digital voice assistants to find which is better at reminders, music, smart home integration, and more. Read More . Explore more about: Christmas, Google, Google Assistant.